"Every follower of Jesus Christ knows that the most powerful ideas of the Christian faith are the resurrection and the atonement of Jesus Christ. Because of him we can be forgiven of our sins and we will live again. Those powerful ideas have been explained in countless sermons from this pulpit and a million others. They are well known but not well applied in the lives of most of us. "Our model is not the latest popular hero of sports or entertainment, not our accumulated property or prestige, and not the expensive toys and diversions that encourage us to concentrate on what is temporary and forget what is eternal. Our model—our first priority—is Jesus Christ. We must testify of him and teach one another how we can apply his teachings and his example in our lives." What are the most "powerful ideas" that influence us in this life? 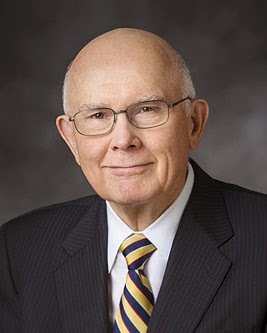 Elder Oaks considers that question and encourages us to ponder what we believe and what we teach, what are the foundations of our faith and action. 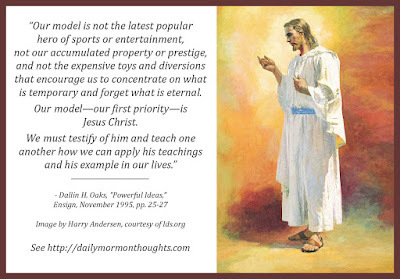 We should do more testifying and teaching about the Savior! That would bless us as we strive to follow and apply those teachings in our lives.